I had decided that my next undertaking is to (finally) draft the perfect sleeveless tunic pattern for myself. You know, something that I could always go to when I had found a nice bit of linen, or to which I could easily add kimono sleeves, big pockets or inset side panels or that could turn into a dress if needed. It's something I've been meaning to do for ages, but never really got around to. For this, I knew I'd likely need to do a couple of muslins just to get everything right, so I turned to my trusty fabric cabinet. Surely I would find something potentially 'disposable' there that I could use for this job. Like many art and craft oriented people I have a tendency to collect things. I know people (and you do too) who have problems with pack-rattiness. People who keep everything and have so much stuff they don't know what to do with it. Luckily, I don't fall into that category. My collections are pretty much under control. Prior to moving to this house, I had always lived in very small spaces so I have good storage and editing habits. And none of my collections are useless, being at least somewhat practical (small bowls of every colour and material), consumable (bamboo socks - black) or simply necessary for life as I know it (a myriad of scarves for every season and occasion). So they don't usually worry me. The largest of all my collections is my stash of beads. Even this extensive collection is not a problem. These are immaculately sorted by colour and material and stored in plastic cases. OK, lots of plastic cases. 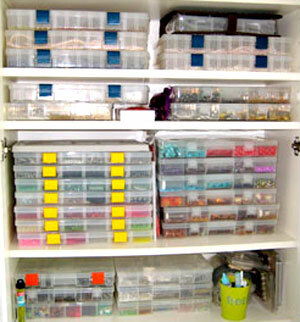 - but beads don't take up much space. They are heavy, but I'm not moving so it's not an issue. And every time I need a piece of jewelry of a specific design, length and colour for a look, I can simply put one together. 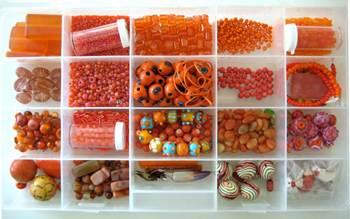 The thing I really love about my bead collection is the sustainability of it. Yes, that trendy term. The beads are never consumed. Once a necklace or bracelet outlives it's outfit, style or colour trend, it can be broken down and the beads returned to the collection for re-use at a later time. I have beads that go back decades, that have been used in many different incarnations over the years, and that will be used again in the future. Instead of getting going with the sewing, I ended up spending a chunk of my day with the fabric stash. It was a little more extensive than I realized. First I stared at it for a while. Then I reorganized it. And then I stared at it again. Then I looked up pictures of other sewists' stashes on the web. OK, that made me feel quite a bit better. (Holy crap some of you have a lot of fabric!) Just google fabric stash and you'll see what I mean. This one is pretty common when I am working. I spend all week thinking about making the perfect 'thing' - whatever that is at the moment. I spend a chunk of Saturday shopping for, then washing, drying and ironing the fabric. Saturday night I review the pattern or draft up something new. Then Sunday comes and I don't start the sewing because I have too much homework to do. So the project goes into the stash and completely out of my head. And by the time I get back to it the passion is gone, or the season is past. Somewhere at left you'll see a nice piece of coral cotton slub jersey and a full 3 metres of both purple linen and tomato soup silk noil. These are good examples of Projectus Interuptus. I know that a few of these will turn up in projects soon. But it would have been so much better if I had just used them right away as originally planned. Oh yeah, you all know this one. The fatal attraction you sometimes feel for a bolt of fabric. Maybe it's the hue, or the pattern, or even the price. You can't help yourself! Next thing you know you are the proud owner of 3 metres of total textile gorgeousness, but have no plan of how to use it. I'm prone to this with odd fabrics. Hence the presence of an orange and brown mottled, textured, distressed knit of unknown fibre content and the black coat weight wool (embroidered and embellished with grey felt flowers) that you can see on the top shelf. Gosh, these are cool fabrics. But what was I thinking? Good luck using these, Gil. This often follows infatuation. 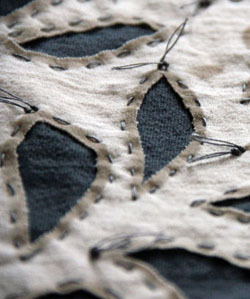 You have this fabric that is wonderful ... and now you are terrified of actually using it. And of course this is not like the bead stash. Once you've cut into it, you can't return the yardage to it's original state to use it again. The fabrics in my stash that frighten me include a stunning pale spring green silk/bamboo herringbone twill (not shown), a piece of lime silk dupioni that is painted, embroidered and beaded and a short length of white silk chiffon with brightly embroidered circles. Too pretty. However, you'll be glad to know that I have prepped the green silk/bamboo and have done some doodling about its use, so this is going into production soon. I don't know about you, but when there is a nice chunk of something left over, I can't part with it. Who knows how I might use it in the future, but it is way too pretty to throw out. Hence a bunch of Ikea boxes labeled things like 'short lengths dark', 'short lengths velvet', 'washed white cotton', etc. This one is a result of having only one chain of fabric stores in Ontario, and no independent stores under a 45 minute drive from where I live. Once again, I have the perfect project in mind, but can't find exactly the fabric I want. 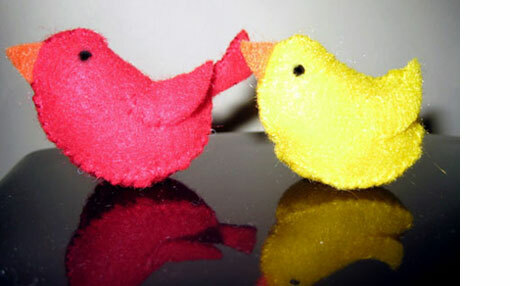 However, the desire to sew is so strong I compromise on colour, fibre or hand. And then after all the prep (as above) it is still not really what I wanted and so I lose heart. There's nothing wrong with any of these fabrics, but they just aren't quite right for me somehow. So it is from this category that I found the fabric for the test pieces. And I'm thinking I'll send some of the rest of this bunch along to the local charity shop. It will free up some shelf space for new pieces! How do you feel about your own fabric stash or other collection? Leave a comment and let me know!